This fabulous bar features some of the most creative drinks, tasty tapas and happening jazz to be found in the City of Angels. The bar has been modelled after a ‘speakeasy’ in the roaring 1920s and accordingly possesses a carefree and flamboyant atmosphere. The bar is the perfect spot to linger over classic cocktails with friends, have an intimate tête-à-tête with a loved one, meet with business colleagues, celebrate a special occasion and enjoy live music. Be dazzled by our brilliant blue signature cocktail — The Sapphire. Here we perfectly blend together Grey Goose vodka, mango juice, orange flower water and a hint of fresh vanilla. It’s topped with kaffir lime foam and there’s a special loyalty gem waiting for you at the bottom. Lively and sociable patrons can even mingle at our beautiful 5-meter long black marble bar and learn the finer points of mixology from our expert team. We’re also got a unique collection of specialty bite-size cuisine, perfect for sharing with the whole gang. Chon is the Thai word for spoon: our very own symbol of service, dining and sharing. At our signature Thai restaurant and cooking school, you will be served a truly local meal while enjoying some fascinating history. Set within a cluster of three century-old Thai teakwood houses which were sourced by silk tycoon Jim Thompson and once formed part of antique dealer and OSS agent Connie Mangksau’s home, this hallowed venue has entertained global glitterati, such as Jackie Kennedy, John Rockefeller, Roger Moore, William Holden and Henry Ford. Come sip on Connie’s favourite Thai tipple of whisky soda while sampling The Siam’s revival of traditional, home-cooked Thai cuisine and surrender to Chon’s authentic charm overlooking the Chao Phraya River and its spectacular sunsets. And while you’re here, master the art of Thai cooking by signing up for a private class with resident executive chef extraordinaire, Blair. Learn the tricks of the trade and take away authentic knowledge to share, or impress, with family and friends back home! Since opening its doors twenty years ago, Lin-Fa has established a reputation for excellence and innovation. The restaurant’s cuisine and elegant atmosphere has become a beacon for Bangkok royalty, politicians, dignitaries, celebrities, socialites and gourmets. Thanks to its Chinese delicacies, the restaurant has become a favourite haunt for locals wanting a hearty get-together meal with colleagues, friends and family. Founded on the basis of imperial and Cantonese cuisine, the restaurant’s signature dishes include Peking duck, dim sum, Sichuan hot and sour soup, Hong Kong-style barbecued suckling pig, shark’s fin soup and pan-fried prawns in sweet cream sauce. Recently renovated, the restaurant’s interior has morphed from luxurious Chinese teahouse to contemporary dining room with a chic and cosmopolitan look. Decorated with beautiful Chinese paintings, traditional furniture and priceless oriental artefacts, the overall ambience is spacious, airy, bright and, of course, elegant; with the enchanting and ambient setting harking back to a romantic and refined bygone era. The Opium Spa at The Siam hotel is a sanctuary of wellness in the heart of Bangkok. Inspired by natural beauty, the spa links the discovery of one of the world’s most fascinating cultural environments to the health and wellbeing of our guests. Set in opulent surrounds and intimately private, the Opium Spa provides a haven for renewal, rejuvenation and respite from the hustle and bustle of cosmopolitan living. We bring to you exclusive Sodashi therapies and spa products that not only regenerate the skin, but also impart a profound sense of wellbeing to spirit and mind. Unparalleled in performance and purity, Sodashi employs only the finest ethically-sourced essential oils and plant actives to visibly heal and nurture. Choose from facial, body and massage therapies or indulge in a tailored multi-day spa package to suit your individual needs. 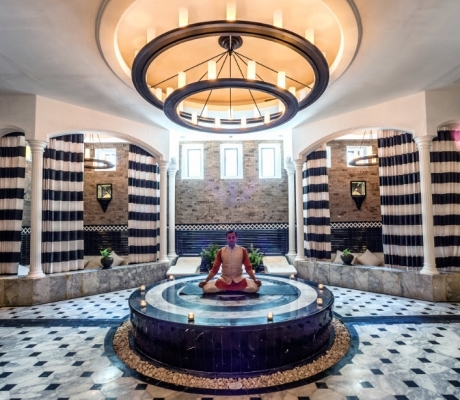 Or why not unwind in our sumptuous hammam-inspired Bath House with dry and steam saunas, steam showers and Jacuzzis. We also have a junior and teen spa treatment menu available.